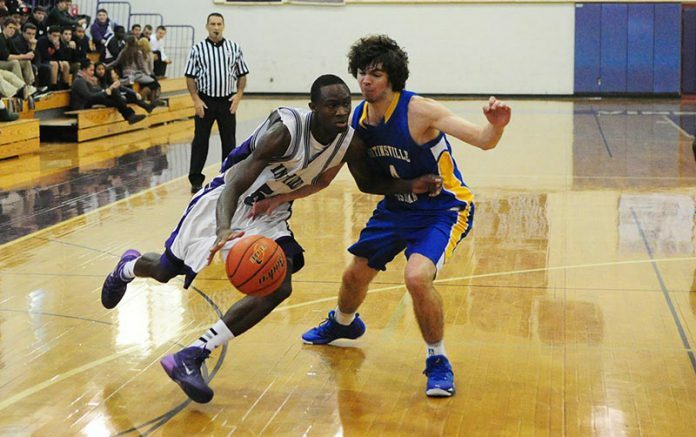 The Martha’s Vineyard Regional High School boys varsity basketball team picked up a solid 71-57 non-league win over Whitinsville Christian School Saturday at the Sancy in Oak Bluffs. They also had to overcome the loss of senior guard, co-captain Kane Araujo, who went down with a knee injury during the third quarter. The Vineyarders responded well to the setback by outscoring the Crusaders 29-15 in the third quarter to lead, 55-38, entering the final period. Deshawn James chalked up 29 points to lead all scorers as the Vineyarders improved to 3-1. “The pick and roll with Deshawn, they didn’t have an answer to or an adjustment, so he just kept taking it to the hole,” Mr. Joyce said. The Vineyarders got off to a fast start, maintaining an eight-point lead well into the second quarter. The intensity and execution from the hosts dropped in the final five minutes of the half as Whitinsville, the 2010-11 MIAA state Division III champs, battled back to close within 26-23 at the half. Tim Roberts had a great game at both ends of the floor, finishing with 16 points. Navardo Anderson added 12. Tim Roberts scored 17 points, Navardo Anderson had 16, and Deshawn James added 10 as M.V. overcame a 9-0 deficit and defeated Snowden International 63-47 Monday in Boston. 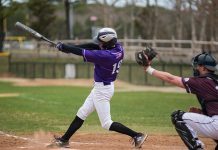 The Vineyarders start the Eastern Athletic Conference schedule Saturday with a game in Attleboro against archival Bishop Feehan. The jayvee game starts at 1:30 pm and the varsity game is at 3 pm.